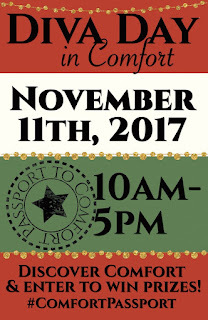 Join us on today, Saturday, November 11th from 10:00 am to 5:00 pm for a day of shopping and specials at local merchants in Comfort. New this year...the Comfort Passport! The more businesses you visit the bigger a prize you have a chance to win! Get stamped at each business you visit. Turn it in at the last one of the day and your passport will be placed into a drawing for a gift basket! Several prizes are available. 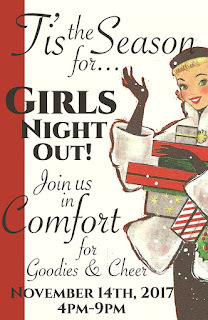 Visit one of our participating businesses for more information.